← A New Vitamix Product, a Kale Smoothie, and a Sweet Price Drop! Offers recipe exploration and reminds you what you can make. Makes measuring easier, especially for sticky ingredients. Guides you through more complex recipes. Update: the scale is now available reconditioned at a discount. 1 What exactly is the Vitamix Perfect Blend? What exactly is the Vitamix Perfect Blend? The Vitamix Perfect Blend is a digital scale that wirelessly connects to your smartphone or tablet. Through their app (available for iOS and Android), you select a recipe, then it guides you through making it. In addition to making measuring things easier, it also makes a precise calculation of the nutrition information for your blend, which you can then log to Google Fit or Apple Health. You put your blender container on the scale, then the app tells you what to add, and it tells you when you’ve added enough of that ingredient. A progress indicator shows on the scale display, as well as in the app, and then the app chimes once you’ve added enough of each ingredient. Its default behavior is to automatically progress to the next ingredient after the chime, although you can override it by tapping a step (and you can take ingredients out if you accidentally added too much). 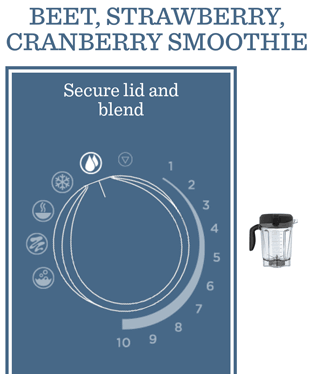 Once you complete your blend, you can tell the app if you are consuming the whole thing, or only part of it. If you are having a portion, it prompts you to weigh out how much you are having, and then it logs the nutrition info. Or you can check out Vitamix’s info page about the scale. Vitamix partnered with Perfect Company to make this scale. Perfect Company launched their first product in 2013, which was a smart scale specifically for making cocktails called the Perfect Drink. Then in 2014 they released the Perfect Bake. (The early versions used less precise scales and required a wired connection.) That history is relevant because 3 years is a long time for tech products, and they have been through several iterations. The result is that the app does almost everything I could imagine it should, and it works smoothly. This year Perfect Company released the Perfect Blend. There is an unbranded version, and then there is the Vitamix version. The Vitamix version lets you customize the app for your particular Vitamix model. You can use the Vitamix Perfect Blend with all of the other Perfect apps, including the Drink and Bake. However, you need the Vitamix Perfect Blend scale to use the Vitamix-specific features of the app. One of my concerns with the transition to the Perfect Blend from the previous products was that many smoothie ingredients are harder to divide precisely. When measuring liquids or powders, you can pour just the right amount, but when I make a smoothie, I often use whole fruits. I want to use 1 apple, not 5 oz of apple. How does the Perfect Blend deal with this? Two ways: you can just tap to the next step to move on, and the nutrition information will correctly use what was weighed. Or, you can adjust the number of servings (on the fly), and the app will scale all of the other ingredients accordingly. One interesting thing is that if you make a recipe multiple times, the nutrition facts may come out slightly differently. That’s because each ingredient is weighed, and the app calculates the nutrition facts from the measured amounts. A brief aside about Perfect Company Support: I emailed them a few times with questions, and each time they responded super promptly with knowledgeable replies. (I did not identify myself as a reviewer.) They appear to be making customer support a high priority. There are currently over 500 recipes in the app, and they plan on continually adding more. The app lets you set dietary preferences (vegan, vegetarian, dairy free, gluten free, egg free, nut free), as well as exclude specific ingredients. As someone who hates bananas, it’s nice to be able to exclude all of their recipes with bananas. There’s also a part of the app called the Pantry where you can tell it what ingredients you have on hand, and it will find recipes based on those. However, I think this feature is better suited to the Drink and Bake apps, where more ingredients have a long shelf life. I can’t imagine entering different produce that I buy every week into the app, although I guess it would work with some blending ingredients. The app also has a shopping list section that lets you add items automatically from a recipe. There doesn’t seem to be a way to get the app to export the shopping list, but I guess the advantage of keeping the list within the app is that once you buy the items, it lets you check them off and add them to your app Pantry. The app also has a tool for setting up a meal plan. You add recipes by the day, and it can generate a single shopping list for you. Then you choose a start date, and it will prompt you with the recipes you chose, day by day. If you don’t have all of the required ingredients for a recipe, you can edit a copy of the recipe, and make substitutions. To change an ingredient, you just select it, then you can choose a different ingredient. You can either select from a categorized list, or you can start typing, and it will search. Their system had all of the ingredients that I could think of already in it. Once you have an ingredient, there are a bunch of options for how to specify an amount. You can do it by count (e.g 10 almonds) or by measure. However, I found the count feature to not calculate nutrition stats for the recipe properly, so I think it’s best to go with measures. With measures, you can enter an amount either by weight or volume. Weight will be the most accurate, and you can use the scale to automatically record the weight of an ingredient to your recipe. You can also create a recipe from scratch. For smoothies, it defaults to 3 ingredients for you to fill in, but you can easily add or remove ingredients. Then, if you create an account, you can save and share recipes. I created this recipe. Those nutrition facts were automatically generated by the app. You can view it in a browser without needing the app. If you have the app, you can tap to import it. One thing that briefly confused me is that the buttons do different things depending on if you do a short press or a long press. Once I figured out what was going on, it was easy enough. If the scale is not connected to a device, you can use it as a normal digital scale, and it also has a countdown timer. The scale defaults to grams, (which I like), but you can switch it to oz with a button press. The scale has a blue backlight that comes on when there’s activity, and then after a while the light goes off, but the display stays on until you turn it off. More accurate than volume measurements. Volume measurements of liquids are OK, but once you have powders or chunks of things, volume becomes super imprecise. And leaves are especially bad. For the Kale in the above smoothie, there’s a wide range of volumes that I could describe it with, but there’s no question of the number of grams. Avoid dirtying measuring implements. Particularly if you have to measure sticky things like nut butter or honey, it’s nice to put ingredients directly into the container, instead of having to fill a measuring spoon or cup, and then having to get all of the sticky ingredient out of it. I hope the advent of these sorts of smart scales gets Americans to use kitchen scales more. The smart aspect of the scale also helps guide you through a recipe. Most of the things that I make with a Vitamix are simple enough that this doesn’t seem like that big a deal, but it could be for some people. Either if you’re just starting out, or if you want to make more complex things, the real-time step-by-step instruction could be helpful. It’s sort of like a futuristic cookbook. Another useful thing about using this scale is that it guides you to make exactly the amount you intend. When you have a 64-oz Vitamix container, it can be easy to overdo amounts. It’s natural to keep putting things in until the container is full, but that results in a smoothie that is more than a single serving. Some people store leftovers in the fridge, but I like to drink smoothies right after blending for maximum freshness. One thing that previously helped me with portion control is to use the 32-oz container when blending a single serving, but using the scale is even more effective. Update: Vitamix and Perfect Blend updated the app significantly, and I wrote a new post about the the update. 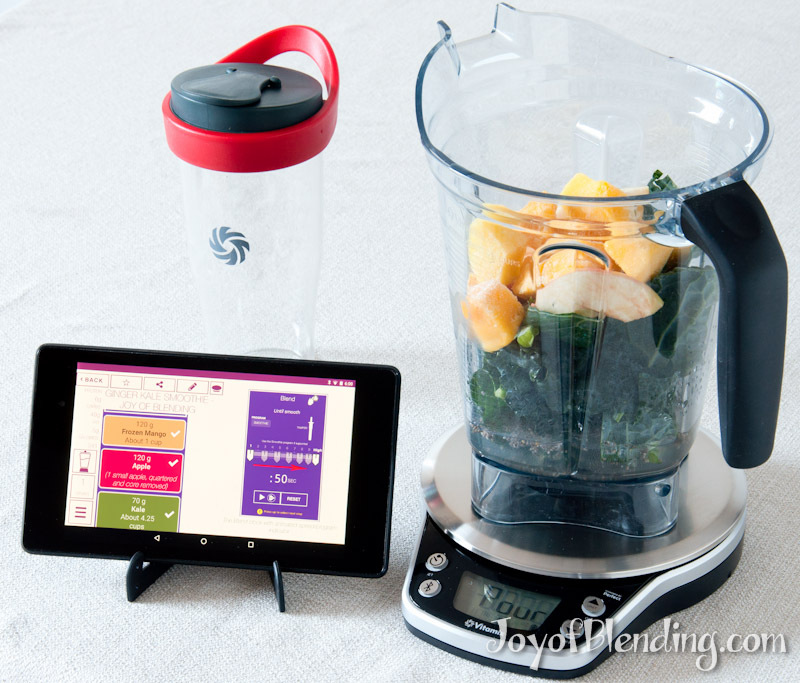 You won’t be able to see the Vitamix-specific part until you connect a Vitamix Perfect Blend Scale, but you can preview the rest of the Perfect Blend app by installing it for free. It is in the Apple, Google, and Amazon app stores. That said, the magic really only happens once you connect the scale. My one complaint with the app is that you cannot rotate the display. Phones are locked in portrait position, and tablets are locked in landscape. This generally makes sense, but if you have a small tablet like I do (Nexus 7), it would be nice to have the option to switch to portrait view. I contacted Perfect Company support about this, and they wrote back right away to say that others have made the same request, and that they are looking to add it to the app. 300 recipes submitted by Vitamix. Each of these recipes comes with a warning that it was designed for a Vitamix blender, and that it might damage a lesser blender. It turns out that you do not need to have the Vitamix scale to view these recipes in the app. When you connect the app to the Vitamix scale, it will ask what model and container you have. Based on your selection, the app customizes your experience. This is a neat feature, but at this point I am mostly disappointed by the customization. As you can see in the above screenshots, you also get a custom container icon that matches your container selection. In principle this is a nice touch, but it partially comes up short: the blender icon does not depend on your model or container selection. If you have a C-Series Vitamix with 64-oz container, the icon matches, but if you have anything else, the icon will not look like your setup. This is not a big deal, but it’s a bit sloppy. I was more disappointed that, as far as I can tell, the container selection does not influence the app other than to modify the container icon. I was hoping that the container selection would constrain the amount you can blend, but it does not. In addition to not depending on the container, the batch sizes do not have reasonable restrictions. For example, in the peanut butter recipe I was able to adjust the batch size down to below 1 oz. That amount wouldn’t work in even the narrowest Vitamix container. This extreme example is obvious, but less obvious is the fact that you can’t make 8 oz of peanut butter. Also, the app does not prevent you from scaling up a batch beyond the capacity of the largest Vitamix container. When you adjust batch size, it does tell you the total volume, so if you pay attention it’s not a big deal. But I think it really should have a limit. Interestingly, some recipes do enforce a minimum batch size. The hummus recipe does not let you select less than 9 servings, although you can adjust the serving size down to 1 oz, which would make the total volume too small to properly blend. So, it appears that the app has the ability to enforce minimum cutoffs, but, at this point, Vitamix has not properly used it. Another part that Vitamix did not customize by model/container is blending time. They chose medium blending times that should do OK on all models. But if you have something tough like kale and berry seeds, the smaller S-Series models will take longer to get them totally smooth compared to the more powerful models. There is some weirdness with to-go/personal blending containers. 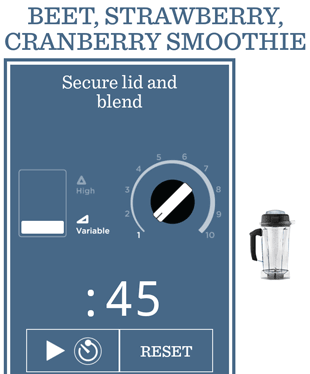 The app is built to let you choose a traditional blending container or a “personal” container, where you screw the blades onto the top of a cup, then invert it to blend. When you select personal blending in the app, it reverses the order of ingredients. This makes sense, since you invert the container to blend with personal blenders. However, the problem is that the app allows you to select personal blending, even if you have already indicated that you are using a model that is incompatible with the personal container. 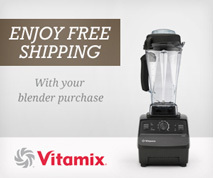 (Currently only S-Series Vitamix models can use a personal blending container.) The app also lets you select the personal container for all recipes, including ones that won’t work with it. For example, to make peanut butter you need to be able to use the tamper, which is not possible with a personal container. I was also disappointed with some of the Vitamix recipes. There are two coleslaw recipes, but neither includes instructions for how to shred cabbage using a Vitamix. There is an easy technique, which they could have described. Instead the recipes just use the blender for making the dressing. If you are hoping the app will teach you how to put your Vitamix through its paces, the app currently comes up short. The Vitamix Perfect Blend comes with two smoothie cups. These are not quite as nice as Vitamix’s other on-the-go smoothie cup, which is double-walled, but they are decent. There is also a device stand for propping up your phone or tablet. The stand is slightly rubberized, and I found it to work well for holding a phone or tablet. There’s also a short paper instruction manual, but I was able to figure everything out before I got around to reading the manual. You obviously need a smartphone or tablet to use the smart features, and no smartphone/tablet is included. You also need to provide 3 AA batteries or a micro USB cable for power. The nutrition and measurement aspects of this smart scale and app are great, but the Vitamix smarts are currently a bit lacking. This product could be great for you if you’re interested in keeping track of your nutritional intake. And it makes measuring easier and more accurate. It also gives a new way to discover recipes. Finally, if you are intimidated by any recipes, the app will guide you through making them. However, the Vitamix part of the app is currently lacking in terms of enforcing feasible batch size and teaching techniques like chopping vegetables. Also note that the scale is covered by Vitamix’s awesome 30-day risk-free in-home trial, in which they pay for all shipping and give a full refund if you decide to return the product within 30 days. Here’s the link to the Vitamix Perfect Blend. At this point it’s shipping to the US only. I will try to find out if they have any plans for a Canada launch. It sounds like Vitamix does not plan to sell the scale in Canada in the near term. I’m guessing that means that they will not sell it in Canada within the next month, and it could easily be much longer than that (6 months? a year? longer?). Too bad, I know. Your best bet is probably to try to get access to a US mailing address. You can order it from Amazon.com and it will ship to Canada. I ordered one. Shipping was high but wanted to give it a shot. Amazon sells the non-Vitamix branded version of the scale. At this point there isn’t a big difference, but it’s possible that in the future the branded version will unlock some functionality with the new Ascent Series models. THANK YOU!!! I just ordered. Yippe. You are the best! Very cool idea. Looks like it’s very useful for portion control – like you said, the 64 ounce jar can make it difficult to know just how much you’re going to end up with. I’m in Canada too and I suspect we’re SOL – they don’t even sell the tamper holder for the 7500 in Canada. I would like to purchase this product. I need to know how much it is and where I can buy it. Does it come with a container or do you need to have a Vita Mix Machine. I have the 64oz container and need to know what else I would need. Thanks. The price is $99, and the Vitamix version is only available direct from Vitamix. Here’s the link. It comes with two smoothie cups. You can use it with any blender container. 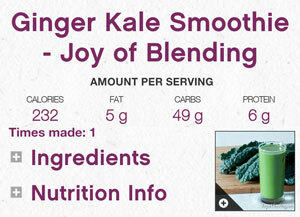 But it has specific blending instructions tailored to Vitamix machines. If you already have a blender, the only other thing you need to use this scale is a powered micro USB cable or 3 AA batteries (plus food to blend, of course). need to know the gross weight of this package to obtain a freight cost for shipping overseas. Hopefully less than 7 pounds. I don’t have all of the packaging material now, so I can’t check for you. If I had to guess, I’d say it’s about 4 pounds. You could try calling Vitamix and asking them. Will this work with the Creations II? I have 32 oz and 48 oz wet blade containers only. Can this be accounted for? Yes, you can use it with any Vitamix. Also, how does it work if you want to make a smoothie with your own ingredients? How does it know how to adjust to calories? You can edit a copy of any recipe in the app, or start a new recipe from scratch. It has nutrition info for most ingredients. If you have an ingredient that’s not in their database you can add it to your “pantry” in the app, where you can specify nutrition facts for that ingredient. Still not available in Canada! Any news? I would like to use the scale for my everyday cooking…How do I weigh a bowl before I add l ingredients? Do I weigh the bowl first without the ingredient? Yes. The scale has a button marked “zero” on the right side, which you tap after you’ve put your bowl on the scale. Yes, via the app. For more details see my Perfect Blend update page. Thanks for your quick response to my last query. I have only tested the Vitamix Perfect Blend scale. As far as I can tell, the Vitamix version is pretty much the same as the Pro version. The Perfect Blend 2.0 scale has lower specs. It has a reduced resolution of 1 g instead of 0.1 g on the Vitamix and Pro versions. The 2.0 also has a max weight of 11 1b instead of 13 lb on the Vitamix and Pro Versions. And finally, the 2.0 is plastic instead of stainless steel. There is a discontinued original Perfect Blend scale that does not have Bluetooth, and it requires a wired connection via the headphone jack to communicate with the app. I have the Pro 750 blender. I’ve been staring at the vitamix scale forever. Like its look and quality. I was hoping to use the scale for nutritional information, for individual fresh food items, when I’m not using the blender. Could you kindly confirm that this is still not possible? Have you had any recent contact with the company to see if they are going to come up,with a new app for at least fruits, vegetables, nuts and seeds? I was hoping to just weigh say, a bowl of strawberries and find out the nutritional content. Am not interest in processed food items. I tend to eat allot of plant based items, but I certainly don’t blend something three times a day. Am diabetic and looking to tighten control my better carb counting. Thank you fir your help. The scale and app should work fine for that. The app includes ingredients with nutrition facts for pretty much all fruits, vegetables, nuts, and seeds. The app and scale are designed around building recipes, but there’s nothing stopping you from having a “recipe” with one ingredient. So, you would make a recipe that just has strawberries. Then you can select that recipe, tare your bowl, and it will tell you the nutrition info as you add strawberries. I was given a Perfect Blend Pro for Christmas and can’t pair with my Kindle Fire HD10 7th generation October 2017. Kindle is listed here as being compatible. What am I doing wrong? The one tip I can give you is to make sure you’re trying to connect from within the app. If you try to connect in the general Bluetooth settings, it won’t work.